jennie's nails and tales: Happy High-Five-A-Versary, To Us! As hard as it is for me to wrap my brain around it, I've been a Sadie, Sadie, Married Lady for five years. That's a whole hand, people! Which is why we're calling it our High-Five-A-Versary. 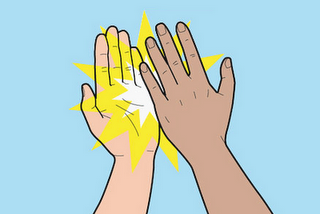 It's only 9am and my hand is already sore as we've decided to high-five every time we see each other today. Yes, ladies and gentlemen, exactly 1,825 days ago, we were in St. Lucia. As I said, all the ladies got manis and pedis at the spa. If you'll notice my MIL's feet (she's wearing the pink capris) you'll see these amazing flip-flops that my Mum got everyone--they're sticky on the sole, so you don't mess up your pedicure! And if you can believe it or not, they're reusable! I STILL have mine! I wouldn't recommend wearing them on the beach, due to the sand situation, but that's really their only logistical problem. The spa also had mimosas, which we took full advantage of, obviously. There were these cute signs all over the resort, and since we were the only wedding that day, our names were on all of them! The Remix, looking super hot in his suit. But he didn't feel super hot, because it was linen. Granted, it meant he couldn't sit down for fear of intense wrinkles, but the coolness was worth it. I love this picture. In the sequence before this one, you can see just how far down my Dad and me had to crouch to actually walk under the flowers. Clearly, the arch wasn't made for tall people. I really love how bright my bouquet was. And it turns out we actually saw the guy cutting them earlier in the day but didn't make the connection until later. Not only did we use this area as a post-wedding-photo-op, but we also had dinner in the gazebo during our honeymoon. Everyone who came with us. It was a funny coincidence that both of our mothers ended up wearing orange (MIL is behind The Remix while my Mum's standing behind me). And speaking of mothers, this is the cutest shot ever of The Remix and his Mom. Here's me and my Mum and behind us, you can really see how cove-y and private the beach was. It was such a cool spot, and wedding-friendly because there weren't many "passer-by" situations (read: randoms in banana hammocks). This was waiting for us when we got back to our room and nothing says: "Let's get it on," quite like balloons tied to the bed. This sure was cute, though. Just lounging in our pool the next morning, waiting for breakfast to be delivered. Oh yeah, didn't I mention that our room had its own pool? That we could jump into from our bedroom? It was totally the best vacation ever. Happy High-Five-A-Versary, babe! Can't wait for our Double-High-Five! Love you! Oh, and with beautiful people of course! Oh, that looks so amazing (especially the private pool!). And you looked radiant :) Happy anniversary!!! Happy Anniversary!!!! LOVE your pics! Your dress was beautiful! Happy 5 years! What a pretty wedding! I love your hubs' linen suit and your flowy, perfect for the beach, wedding dress! Beautiful pictures, looks crazy relaxing! Congrats on five years my friend!!! !